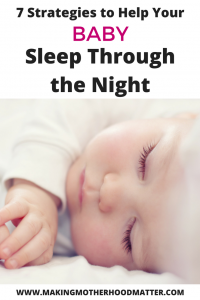 Inside: Find seven strategies the help your baby sleep through the night. I watched tears stream down a fellow mama’s sleep deprived cheeks, as she described her frustration about not being herself lately. It was very clear the minimal sleep she was getting was making it a struggle for her to get through daily routines. In that moment, I wanted to reach out and give her a big squeeze to let her know that I was there to support her. So, if you are that mom or dad, this survival guide is for you. 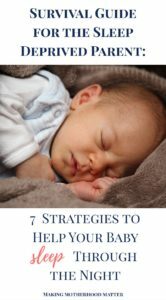 Here, I will share seven strategies to help your baby sleep through the night. 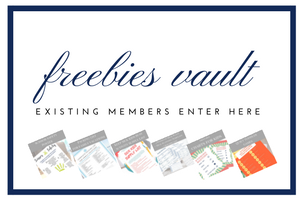 Although I have had my share of sleepless nights, I am so grateful for my friends that told me about the book On Becoming Baby Wise, by Gary Ezzo and Robert Bucknam. The tips and strategies suggested were a huge help, as I navigated through the fuzzy weeks when my daughter was a newborn. Following the suggestions made by Ezzo and Buckman, my daughter was sleeping eight hours at night, by eight weeks old. I hope you will have a similar experience if you decide this approach is for your family. Teach your baby the difference between day and night by establishing a routine. The basic daytime routine entails the following: the baby eats, then has awake time, then sleeps. This sounds simple, but Ezzo and Bucknam believe the order of these activities is imperative. There are two exceptions to this “rule.” The exceptions are the first week the baby is born and at nighttime. After nighttime feedings, the baby should be put back to sleep directly after the feeding. Get a full feeding in with newborn (7-10 days old). The focus of the first two weeks is to get a full feeding session in, without the baby falling asleep. That means doing things to keep the baby awake such as: rubbing his feet, talking, touching his face, switching sides more often (if breastfeeding), or changing his diaper. Ideally, the baby will fall into a routine of eating every 2.5-3 hours, using this method. Make sure the baby is getting fed at least 8 times within each 24 hour period. Use parent-directed feeding to decide what is best for your baby. Parent-directed feeding (PDF) means that you evaluate your baby as a whole. You consider her hunger cues, in addition to her feeding schedule, to determine what she needs. Establish the first feeding of the day. This may be decided naturally by the baby, but should remain fairly consistent day to day (within a half hour). By setting a general time for the first feeding, it will allow you to plan your schedule for the day. Naptime should begin by lasting 1-1.5 hours. Once your baby is one week old, he should begin napping for an hour to an hour and a half, during the sleep phase of the schedule. If the baby is having a hard time falling asleep, try putting him to bed earlier the next day, by 15 minute increments. As he grows, the number of nursing sessions and naps will decrease, although the length of naps will increase. Put the baby to bed while awake. 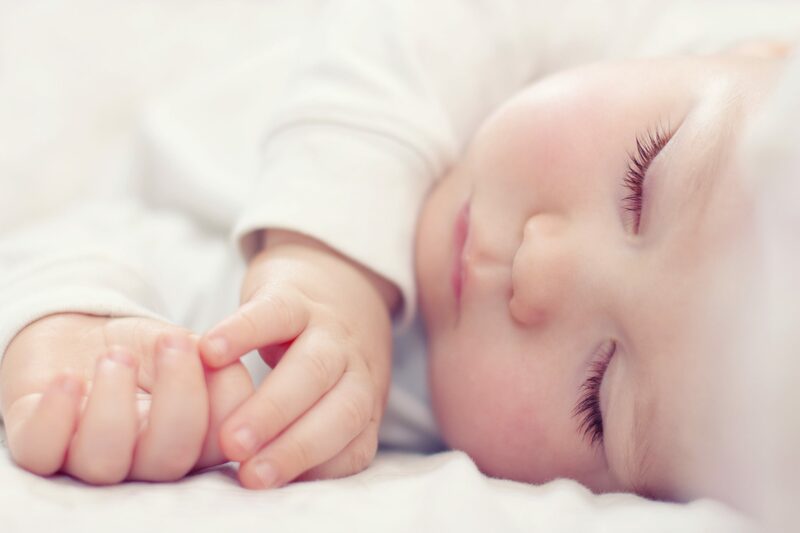 Placing the baby in bed while awake, will help to establish healthy sleep skills, according to Ezzo and Bucknam. In fact, they believe that it is best not to use sleep aids, which include rocking the baby to sleep, nursing the baby to sleep, or using any other method in which the baby would rely on you to fall asleep. They do, however, encourage you to comfort your child if needed. Sometimes you will need to go grocery shopping, attend an event, travel, etcetera. Life will happen, don’t stress out over keeping the routine. In these situations, be flexible and allow your baby’s schedule to change. If the change only occurs once in a while, the baby will bounce right back to the original routine. This schedule is meant to provide a natural rhythm for the baby, not to imprison the family. This is a repost of the article I originally published on Her View From Home. Please know that this article is for informational purposes only. I am not a licensed medical professional. Please consult with your child’s care providers.